All transactions are safe and secure with a reliable history in online purchasing behind each of our associates. Buy the Own a Real Cowbell to own More Cowbell clothing and merchandise. The legendary Gene Frenkle taught us that a band's most important member is the cowbell player. 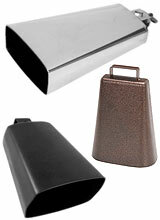 Here's your chance to fill his shoes as we present you with the opportunity to buy a real cowbell. Perfect for sporting events, pep rallies or just to call the kids in to dinner, there are a wide variety of options to choose from. Celebrate the history of the instrument with an antique style bell or impress everyone with a shiny new one. In addition to the Own a Real Cowbell above, browse the More Cowbell Clothing Gallery for more apparel like men's and women's clothes, kids shirts or hoodies.